Where are you headed? In life, in your career, where you’ll spend your time? I imagined my recent vacation would be one of excitement and wonder. 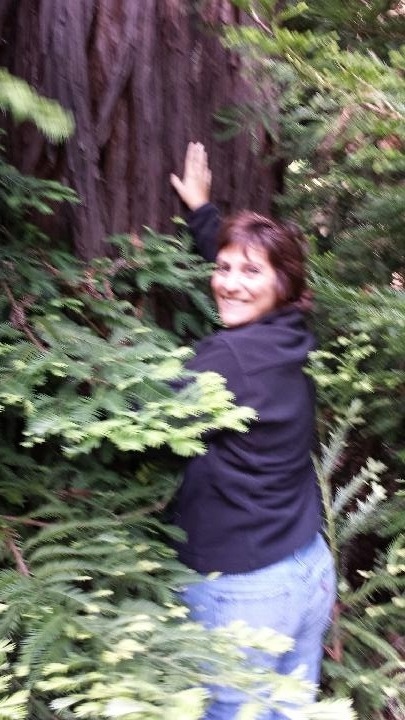 I, for as long as I can remember, had always wanted to see a redwood tree due to the pictures I viewed as a child. I am amazed at the height and vastness of the species. Living on the east coast all my life, I knew I’d have to visit the west coast to do so, and last week I had the most wonderful opportunity to see and touch one of these magnificent trees. The experience was a spiritual one for me; I noticed great feelings well up inside me and I shed a tear of gratitude as my friend snapped this picture. What I learned about dreams that day inspires me to follow more of them as a way to feel like that again. A life lived in this manner would be quite a journey. Imagine if we all gained success by being adamant about attaining our dreams. Be confident, Thoreau says, in the manner of pursuit. You may just live the life you really want. This entry was posted in Centering, Expression and tagged confidence, dreams, goals, journey, life by cherylcamardo. Bookmark the permalink.